The story of the preservation of this small cemetery near Midlothian, Virginia, where our immigrant ancestor Jean Pierre Bondurant is believed to have been buried, was gleaned from various sources, including past issues of the BFA newsletter edited by Mary Beth Lozo and Mary Bondurant Warren. At the 2018 meeting of the Bondurant Family Association in Midlothian, Virgina, the group approved a motion to raise funds to place a marker for Ann Tanner Bondurant, wife of Jean Pierre Bondurant, in the small graveyard on Birdsong Lane, Powhatan, Virginia. A plaque similar to the one for Jean Pierre Bondurant that was dedicated in October 1990 will be developed in the near future. The project will be partially funded by profits from the sale of the 30th anniversary t-shirts (which are still available!) as well as donations. If you would like to contribute to this project, please send your check designated to the Ann Tanner marker to BFA treasurer Amy W. Sanders, 544 Marnie Circle, West Melbourne, FL 32904-5759. If it wasn’t for early researchers of the Bondurant family, this small cemetery might have been bulldozed and lost to us forever! It all started with Mrs. Mary Beth Lozo, of Nixon, Texas, meeting Mrs. Mary Thomas Burton Dennis, of Nashville, Tennessee, at the Huguenot Society of the Founders of Manakin, meeting in 1981. Many years earlier, Mrs. Dennis had spent the day with Al Bondurant of Virginia Beach, Virginia,who showed her a cemetery which he presumed to be the gravesite of Jean Pierre Bondurant. At that time there was a chain-link fence protecting the cemetery, but no visible tombstones. Mr. Bondurant reported that when he first researched the property many years before, tombstones were there and two boxwoods grew on either side of the gate. The graves were in an overgrown briar patch near a field road. David Holland helped Mrs. Dennis to locate the graveyard on a map so she could go see it. Mrs. Anne Travis, of Moseley, Virginia, joined Mrs. Lozo on a trip out to the cemetery prior to the Huguenot Society’s 1981 meeting. What they found was alarming! The chain-link fence had been removed and replaced with wooden picket fence which enclosed a smaller area than the original graveyard perimeter. An immediate effort was made to contact the developer of the subdivision as a road was being cut beside the graveyard. Through the efforts of attorney Walton G. Bondurant, Jr., of Smithfield, Virginia, and Judge John Bondurant of Hickman, Kentucky, an agreement was reached with the developers. The developers would erect the fence around the grave sites if the Bondurants would pay for it. Funds were quickly raised and the present cast iron fence was erected. After the inaugural meeting of the Bondurant Family Association at Midlothian in October 1988, the next project was to erect a plaque commemorating Jean Pierre Bondurant and his family in the cemetery. Again donations met the expenses, and Carroll and Ginny Wray, assisted by Harry Greene, mounted the plaque. Rev. Wayne BonDurant gave a moving dedicatory service at our meeting on October 25, 1990. 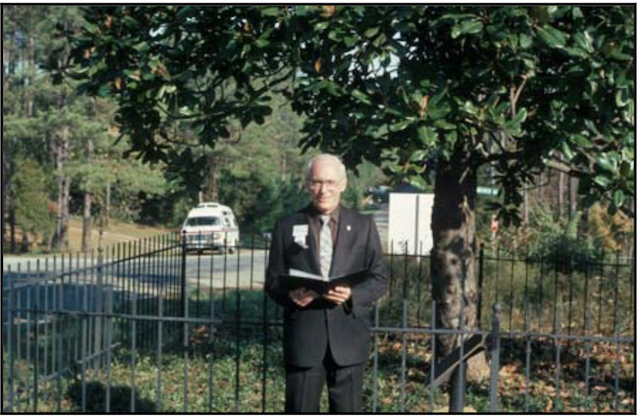 Over the years, BFA members have volunteered their efforts to keep the cemetery in good order. In the summer of 2018, president Bruce Ramsdell, Marvin White, Shirley and Tom Seaborn cleared away the poison ivy that had taken over the area inside the fence so that we could enjoy seeing it at our meeting in October. Thank you! (https://www.facebook.com/groups/142740453048/), you’ll know that Portland, Oregon, is the site for our 2019 gathering in October. Susan Bundrant Scharf has volunteered to be our hostess this year and will be making arrangements for our hotel and meeting locations in the near future. We will be meeting on Friday and Saturday of the last weekend in October (25-26). Watch the BFA Facebook page, the BFA website (www.bondurant- family.org) and the newsletters for more details. members. If you take these 13,623 living descendants and multiply that by the seven or eight generations since Jean Pierre Bondurant’s arrival in 1700, we have at least 100,000 Bondurant descendants! That’s a big family. But most are not aware of this. However, as more people start working on their trees, they may discover that they have Bondurant roots, too. This is what happened to me. My mother had vaguely mentioned that we had a French background. When I discovered my great-grandmother Ruthe Cleopatra Alvatine Bondurant Burroughs, I struck gold. A quick Google of the Bondurant name and voila!! My new expanded family. I must tell you how rewarding it has been to meet my new cousins from all varieties of life. I think the main connection I feel with all of you is a shared reverence for family and history. I encourage you to give memberships (and T-shirts) for your siblings and cousins. They will receive the quarterly newsletter and access to the www.bondurant-family.org website. Most may not be interested, but a few will want to get involved with preserving our family heritage. At least get them on the Bondurant Family Association Facebook page. They will find their lives enriched as I have.